Day of the Dead nicho honoring the original cowboys. 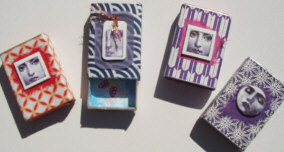 The images are from Ten Two Studios Dia de los Muertos faux postage collection and Wild Wild West image CD. 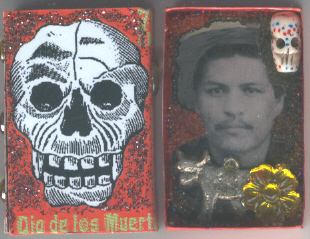 The objects in the shrine are a skull bead, a cow-shaped milagro and a sparkly yellow flower to represent the marigolds often used to decorate Day of the Dead altars. 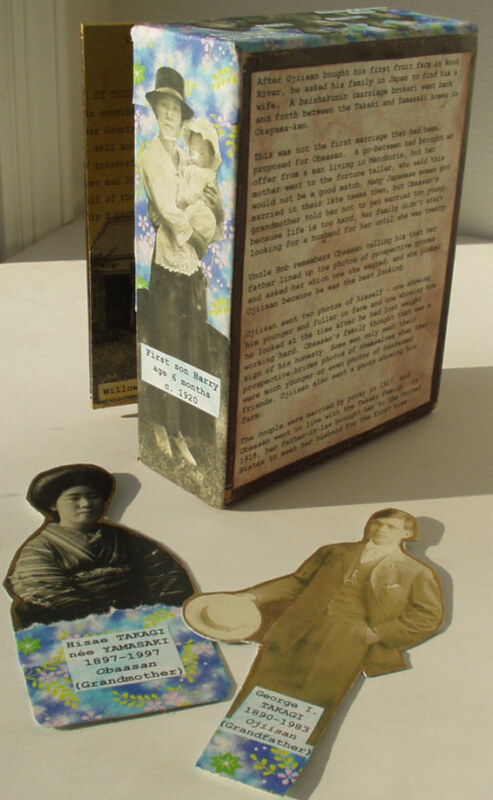 The image of my grandfather standing in front of his first place in Hood River, Oregon, is actually a pocket in which there are cut-out figures of my grandparents taken before their marriage. There is text on the back of the cut-outs and the back of the box. 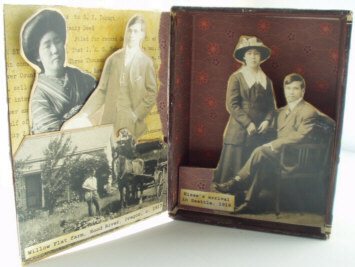 Memory box made from cigar box, origami paper, photocopies of family photos and other documents, computer-generated text, foam core and cardstock. This box tells the story of my grandparents' arranged marriage. The central image in the shadow box is mounted on foam-core and shows my grandparents at the time of my grandmother's arrival in Seattle from Japan in 1918. 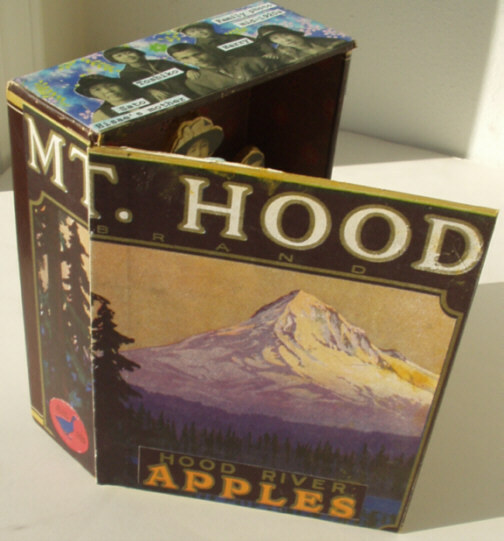 The cover image is a color photocopy of a vintage apple crate label showing Mt. Hood. 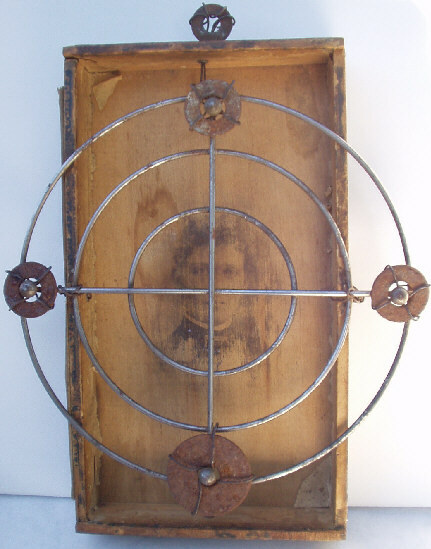 The cigar box, round kitchen trivet and wire were bought at rummage sales in Hustisford, Wis., and the rusty washers on the trivet were found on my sister's farm in Hustisford. 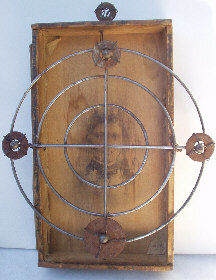 The woman's face was heat-transfered to the wood from a photocopy of an 1880s cabinet card photograph from Grand Rapids, Michigan. Mini-shrines made with matchboxes covered with origami and mulberry papers and embellished with rubber-stamped charms made with gloss white shrink plastic.